Draken International has acquired 22 Mirage F1M and F1B fighter jets in an effort to enhance adversary services for the USAF and other Department of Defense clients. Novemeber 9, 2017 - Draken International, a global leader in advanced adversary air services, has acquired 22 Mirage F1M and F1B fighter jets in an effort to enhance adversary services for the United States Air Force and other Department of Defense clients. The Mirage F1Ms were predominantly flown by the Spanish Air Force and have been fully modernized. This acquisition increases Draken’s fleet size to over 100 fighter jets as the company continues to expand its capabilities. 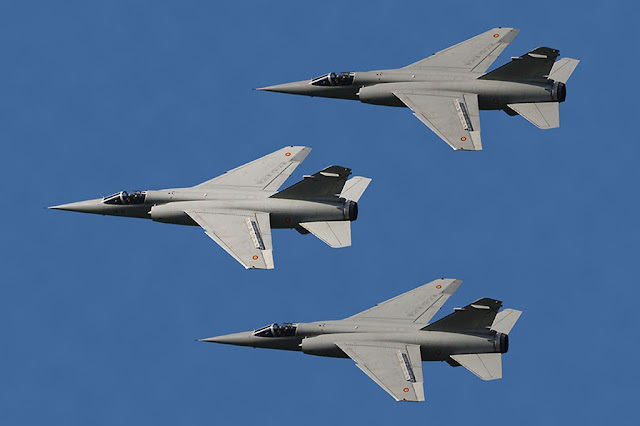 With the completion of the procurement phase, the Mirage F1Ms will soon join Draken’s existing fleet of radar-equipped Douglas A-4K Skyhawks and Aero Vodochody L-159E “Honey Badger” fighter jets. Draken remains the only commercial air service provider to have purchased, imported, certified and executed sustained flight operations with radar-equipped and threat representative fighter aircraft. These important capabilities inherent to the Draken Mirage F1M, L-159 and A-4 are essential for supporting Draken’s Nellis AFB ADAIR contract which provides adversary training for the prestigious USAF Weapons School, Red Flag exercises, operational test support, RTU support, and Combat Air Forces abroad. Draken International is also prepared to use all 22 Mirage F1Ms for various contracts within the US Department of Defense to include the US Navy, US Marine Corps, as well as numerous coalition militaries. As the sole provider of commercial adversary services to the USAF, Draken International is primed to deliver extensive capacity to cover the majority of the 42,000 flight hour requirement for supporting combat readiness training at 12 operating locations throughout the US. The US Naval Aviation Warfighting Development Center (NAWDC), which includes the Weapons School (TOPGUN) and Carrier Air Wing Training, is currently reviewing proposals from contract air service providers for a high-end supersonic, radar-equipped adversary solution at Naval Air Station Fallon. Draken’s Mirage F1M offers Fallon an extremely cost-effective Mach 2+, radar-equipped platform that meets or exceeds all posted requirements. In 1996, the Spanish Air Force, along with Thomson-CSF (Thales Group), spent $96M on a modernization upgrade, including cockpit enhancements, LCD MFDs, Advanced HUD, INS/GPS, Electronic Attack systems and a special performance upgrade for the Cyrano IVM radar. The Spanish Mirage F1M fleet was decommissioned in February 2013 and stored in Albacete Air Base, Spain until Draken’s purchase in September 2017. After extensive research, these Mirage F1s proved to be the best equipped and lowest time fighters of their kind available to the industry.